Germans have fun with their harvest. We saw a lot of these. Thanks to an old hobby, I have known about Deutschland for years. 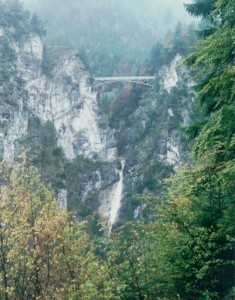 Known here in the States as Germany, it is a beautiful land to visit. It is a land of fairy tales, castles, beer and wine. There is no way to sum up all that the country has to offer in one blog post, but suffice it to say, this is a place I want to return to. We spend a week visiting with friends who lived near Stuttgart and managed to pack in a lot in that short week, but there is so much more I want to see. 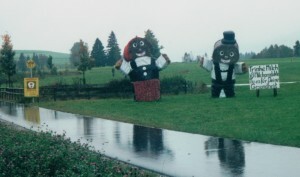 We were fortunate to be there the week of their Oktoberfest. (There is the major one in Munich, but other towns have their own as well.) Since some of my children chose German as their foreign language, I had been exposed to some of the culture ahead of time (and picked up a few phrases). Our middle school German teacher at the time had celebrated Fastnacht each year, with donuts and singing, so I knew a couple of the German pub songs that are often sung in beer tents. If you haven’t been, a German beer tent (at least from my experience) is a large permanent structure, one I would call more a hall than a tent. Each tent is sponsored by a different brewery (it was fairly common for even pubs to have exclusive relationships with breweries) and is filled with long, narrow wooden tables and benches. We went in to one and found a spot at a table. Others were eating what was obviously chicken and drinking liter mugs of beer (which are quite heavy, so the women carrying several REALLY impressed me). Not being able to find the chicken on the menu (apparently there are a couple words for chicken in German), we asked our neighbors what they were eating and soon made friends. While eating our dinner, we listened to the live music, which included the German songs I was familiar with, (occasionally interrupted to announce the World Cup scores) as well as John Denver’s “Country Road,” which must have been a favorite as it was repeated every fifth song or so. (Yes, we sang along.) We bought a round of drinks, as is our custom; our new friends were dumbstruck by the gesture and very appreciative. The favor was more than repaid when heading to the next beer tent, as they knew the people at the door and we were granted admission ahead of many others. Although the focus of Oktoberfest is the beer, the festival is actually much larger, with a carnival atmosphere and activities for families to enjoy as well. 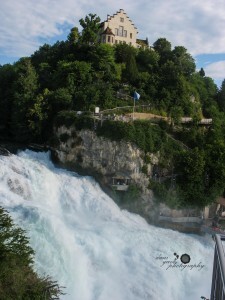 Although most travel itineraries have some sort of focus (the Rhine, The Romantic Road, beer, wine country, etc.) we jumped around, going to places we thought sounded interesting based on the guide books I had picked up back home. We decided that Neuschwanstein Castle was on our “must see” list. This beautiful structure was commissioned by King Ludwig II. 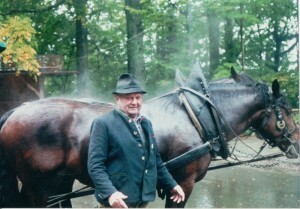 We chose to take a carriage ride up to the castle, rather than walking up the long hill. Our driver was very friendly and was kind enough to pose for this picture. It is easily recognizable in photos as the castle upon which Disney based his famed Cinderella’s castle. (The day we went was foggy, so it was shrouded in mist.) 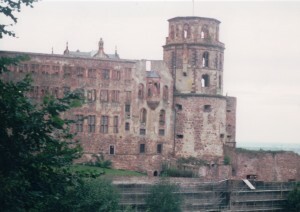 The castle is now operated as a museum and is visited by 1.4 million people a year. Neighboring Hohenschwangau Castle also offers tours. The English speaking tour is at 8 am, so this meant an overnight trip for us. 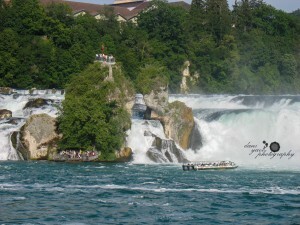 Even before we left home, I had decided I wanted to see the largest water fall in Europe, the Rhein Falls at Schaffhausen. My husband was accommodating, and, since it was the same direction as Neuschwanstein, we made the journey south, through Austria and into Switzerland, with plans to spend the night close enough to minimize the drive time the next morning. 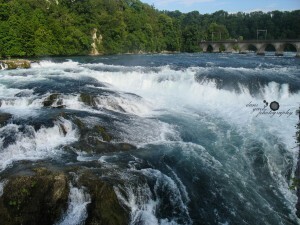 Since we got to Schaffhausen late in the day (thanks to my spending too much time looking at Black Forest Cuckoo Clocks), we only spent enough time in Schaffhausen for dinner and a short walk by the falls. It was however, one of the more romantic places we visited. 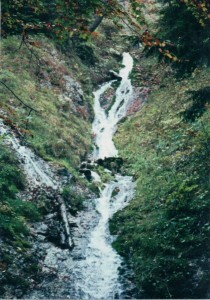 On the way there, we stopped at Triberg and“hiked” (it is a paved footpath) to the top of Germany’s tallest waterfalls (hmm, I guess maybe we did have a theme to our travels). Afterward, we found a small restaurant where we had a wonderful meal and practiced our German (the waiter spoke no English). This was one of the highlights of the trip, as we got by just fine with a pocket dictionary and some creativity. It was also here that I had arguably the best wine I found on the trip. Other day trips included Rothenburg ob der Tauber, a charming walled city. We got there too late in the day to explore the museums, but did go on the Night Watchman’s Tour of the city (offered in English) and then walked the wall on our own afterward. During the tour, we chatted with a young couple who were backpacking around Europe after college and before returning to the states and their new jobs, and they joined us for coffee and dessert afterwards. I was impressed by the fact that they were doing this on a budget of $25 a day, which they said, sometimes meant they slept on benches in public transportation lobbies after deciding to spend more on admission fees to a museum or a more elaborate meal perhaps. (For those used to U.S. public transport, this is much safer than it sounds.) Unfortunately, this was in the days before Facebook; it would have been nice to stay in touch. 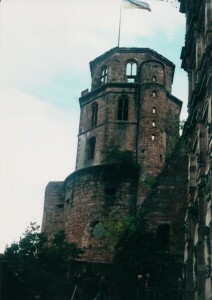 A trip to Heidelberg was well worth the time. We arrived in the afternoon and wandered the old town where much of the castle, which was damaged by bombs in WWII, is still in ruins. There is a castle tour, which I have heard is worth taking, but we were told we would not have enough time to thoroughly enjoy it before it closed that day. (We did, however get to visit the wine cellar and enjoyed a tasting.) The city is home to the oldest university in Germany and has an abundance of choices of cuisine in its restaurants. We chose an Italian one (the menu was in German, Italian and English, so we had to decide which language to order in. I think a future trip would involve a stay actually in the city to further explore all it has to offer. We also became acquainted with a popular pastime in Germany, volksmarching. Our friends looked in the local paper to see who was sponsoring one nearby and what the prize was. They explained that is was a walk, with checkpoints along the way where you could get refreshments, such as sausage and beer. 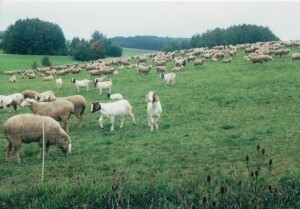 The trail went through a field, past these sheep and goats. Somehow my husband missed the fact that it was a 10k walk, but we enjoyed it anyway (despite some drizzle) and came home with two genuine beer steins for a few dollars. Another day took us to Kloster Andech’s. 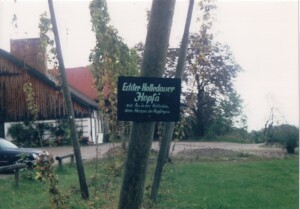 This monastery brewery is owned by the Benedictine monks of St Boniface in Munich and Andechs. 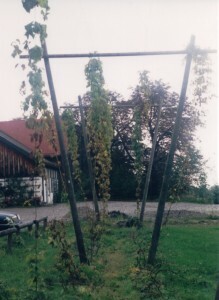 In addition to the brewery, they also have a tavern where we enjoyed good food and beer (though I have to say, we didn’t encounter bad food or beer anywhere we went) and for the first time saw hops growing. This is well out in the countryside, which I noted was very like that of Pennsylvania (no small wonder that so many German immigrants found themselves staying in the Keystone state). As you can see, we packed a lot into a week, but there is so much we didn’t see. Despite the fact that the country is small by US standards, Germany has much more to offer. There are several major metropolitan areas and many towns that witnessed major historical events. I also found the German people to be among the most hospitable I have ever met. I look forward to visiting again and seeing more of this beautiful country.